While just about anything you’d buy at the supermarket can now be delivered to your house in a reasonable amount of time, there are still some purchases that you must — or at least tend to — make in person: Prescriptions, fresh produce, pet food, among others. Of course, even though you only meant to pick up one or two things, odds are you’re going to add a few items you either remember to buy or are tempted into purchasing once you’re in the store. The folks at Nielsen — they’re more than just music, ya know — recently took a look at three aspects of shopping behavior in the consumer packaged goods market: Which shopping list items are the main reason for going to the store; which items are you most likely to be reminded about while you’re shopping; and which products are likely to result in an impulse buy. In terms of “trip drivers,” those products that motivate us to get in the car and go to the store, a number of non-food items appear to provide that impetus more frequently than food products, but we ultimately tend to stock up on foods while we’re at the store anyway. For example, 73% of people said they’d gone to the store primarily to have a prescription filled, compared to 49% for fresh produce. However, fresh produce ends up in customers’ carts 27% of the time regardless of their reason for going to the store, while only 3% of all visits to the supermarket result in someone leaving with prescription drugs. Likewise, dog food has driven 68% of consumers to the store, but it is only purchased 1% of the time. Meanwhile, milk is a both a significant driver (61%) and a frequent purchase (13% of all visits). In terms of items we remember to buy at the store, food and non-food items have the equal potential for an “oh yeah…” purchase, we just purchase the food products more frequently. Shoppers are reminded about 14% of the time to buy canned tuna, which is less than the 18% reminder rate for shaving-related products. However, we seem to stock up on tuna every seven weeks, compared to the more than 12 weeks between shaving-related purchases. Some product categories, like suncare, have a decent reminder rate (15%) but are only purchased a few times a year (every 113 days, per Nielsen). 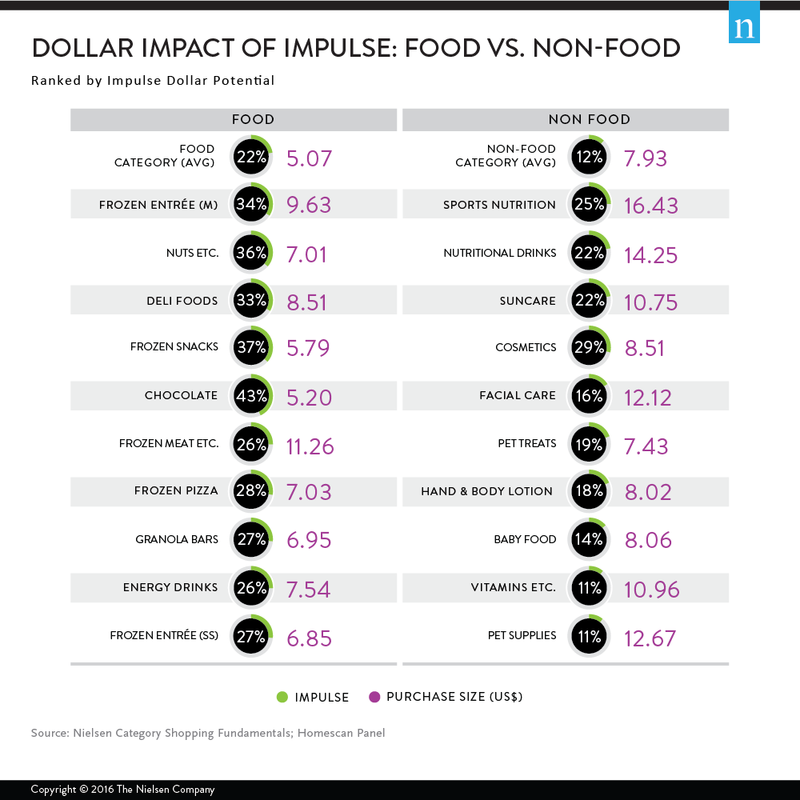 Not surprisingly, food items make for better impulse purchases than non-food products, but those non-food impulse buys often hit our wallets for more money. Chocolate (duh) was the most frequently purchased impulse buy, at 47% but Nielsen only puts a $5.20 value on those purchases. That’s a third of the price tag of the most popular non-food impulse buy category: sports nutrition. These products are impulse buys 25% of the time, but shoppers are paying more than $16. To store-owners, it’s good to know this data because it can help you figure out how to increase the frequency of the higher-cost purchases. At the same time, shoppers should be aware that not all impulse buys are created equal; that you may be paying a premium at the checkout for something you didn’t even think about buying in the first place.